Pemaquid Point Lighthouse is located at the entrance to Muscongo Bay, in Maine. Built in 1827, the lighthouse sits on a bluff comprised of several horizontal layers of rock. The rock can become quite slippery when wet, and there are signs posted warning of the dangers of exploring to close to the water. 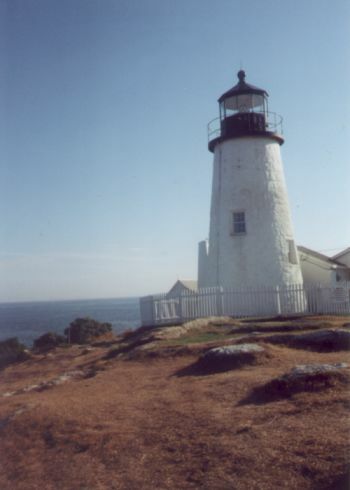 Pemaquid Point Light is only 38 feet tall, but situated on the bluff, the lighthouse stands 79 feet above sea level. The lighthouse and property are now owned and operated by the town and a Fishermen's Museum is located there as well. A very picturesque lighthouse to visit, my family also enjoyed playing in the rowboats and fishing gear found outside of the museum.